One of the most influential modern philosophers was Bertrand Russell (1872-1970). Some commentators say that he was the dominant figure in twentieth century philosophy. This being so, one is obliged to probe some aspects of his career. 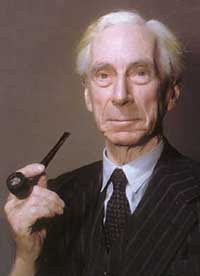 Bertrand Russell was the grandson of Lord John Russell, being reared in a British aristocratic milieu, and eventually inheriting the status of an Earl. However, he allied himself with the Labour Party, being radical in his views. At Cambridge he studied mathematics, a subject which he adapted to philosophy. In 1898, Russell abandoned his neo-Hegelian idealism in favour of realism as the “new philosophy of logic.” He acknowledged the importance of science in this transition. His early work Principles of Mathematics (1903) became famous for contending his subject in terms of a close relationship to logic. This has been described as logicism, meaning the view that mathematics is significantly reducible to formal logic. Russell arrived at his basic view of “mathematical logic” quite independently of the obscure Gottlob Frege (1848-1925), the German mathematician of Jena University who converged in this form of conceptualism (or logicism). In collaboration with Alfred North Whitehead, Russell subsequently produced Principia Mathematica (1910-13), which became celebrated in terms of a “new logic.” He was viewed by his admirers as a British version of Aristotle. Russell has been described as deducing mathematics from logic. “One of the effects has been not so much to subordinate mathematics to logic, which is what Frege and Russell wanted, but to subordinate logic to mathematics” (Alfred Ayer, “Frege, Russell and Modern Logic” in Bryan Magee, The Great Philosophers, Oxford University Press, 1988, p. 308). Bertrand Russell became a Professor of Philosophy. From 1910 to 1915 he was a lecturer at Cambridge University, during which period he was tutor to Wittgenstein, whom he regarded as a genius. He departed from mathematical logic and composed some books on general philosophy, including The Problems of Philosophy (1912). His Oxford follower Alfred Ayer referred to this work as “the best introduction to philosophy that there is” (ibid., p. 309). Russell here describes “various traditional philosophical problems from an empiricist standpoint” (ibid.). He was continuing the British empiricist tradition associated with Locke, Berkeley, and Hume. Russell is celebrated as having inspired the analytic philosophy favoured by universities, sharing this honour with G. E. Moore. Later, Russell veered away from philosophy, becoming engaged in political and educational activities having a flavour of radical socialism. He gained fervent admirers and strong critics. “The permissive society was implemented by Bertrand Russell, whose advocacy of free love is memorable for the misery created in his family” (Shepherd, Some Philosophical Critiques and Appraisals, 2004, p. 251). He married four times and became notorious as a womaniser. His book Marriage and Morals (1929) gained brickbats. In contrast, he later acquired the Nobel Prize for Literature in 1950. Russell was eventually hero-worshipped by the younger generation of the 1960s, who uncritically assimilated his political and social views, including the unwise disposition for free love that created so many problems. Russell was not only a symbol of pacifism and the campaign for nuclear disarmament, but also more questionable deportment. He wrote some further works on philosophy, including his famous History of Western Philosophy (1946). This book has received very differing assessments. The publisher Routledge refers to “the best-selling philosophy book of the twentieth century and one of the most important philosophical works of all time” (Routledge edition, 2000). A conflicting commentary came from Professor Bryan Magee, who says that Russell’s History is “overrated.” One judgment here is: “The treatment throughout is superficial, not to say flip” (Magee, Confessions of a Philosopher, London: Phoenix, 1998, p. 220). Furthermore, “for all his [Russell’s] genius he radically fails to understand Kant, and consequently the whole tradition of philosophy that has grown out of Kant’s work; his entire chapter on Schopenhauer is consistent with his never having read that philosopher’s main work” (ibid., p. 221). These are weighty criticisms indeed. One is obliged to look closely at Magee’s personal description of Russell, whom he met towards the end of the latter’s long life, in 1960 to be precise. Magee found that Russell was an elegantly courteous host, mentally alert at the age of 87, a fluent and humorous talker, and possessing a social record of impressive contacts the world over. For instance, Russell described how he had taught philosophy to the poet T.S. Eliot at Harvard. “He did not tell me what I subsequently discovered, that he [Russell] had had an affair with Eliot’s wife while the Eliots were living under his roof” (ibid., p. 264). The subject gains due praise from Magee for his career achievements. However, significant contradictions for contemporary philosophy are emphasised. Although Russell is regarded as the founder of modern analytic philosophy, “he never regarded analysis as an end in itself” (ibid., p. 216). Bertrand Russell started language philosophy, but did not regard this as the objective, unlike his successors. More pointedly, “to the end of his days, he believed that the purpose of philosophy was what it had always been thought to be, namely the understanding of the true nature of reality, including ourselves” (ibid., p. 217). In that respect, Russell was a polymath, not a specialist, and certainly not a linguist. Even more pointedly, Bertrand Russell was one of the few who “understood clearly – what many people to this day fail to understand – that science of itself does not, and never can, establish a particular view of the ultimate nature of reality.” What science actually does is to “reduce everything it can deal with to a certain ground-floor level of explanation” (ibid., p. 218). Magee finds the last philosophical book of Russell to be significant for reasons not always proclaimed. My Philosophical Development (1959) is described as a “substantial work aimed at the serious student of philosophy” (Magee, Confessions, p. 220). The deduction is made that Russell was here acknowledging how his empiricist quest had failed. In the last paragraph, Russell states that “empiricism as a theory of knowledge has proved inadequate” (ibid., p. 222). Magee concludes that Russell had finally arrived at a view which Kant had made a starting point in his own critical philosophy generations before. Moreover, Magee urges that Russell failed in pursuing logic and the philosophy of science, neither of these avenues having afforded a due explanation of known reality (ibid., p. 219). Ultimately, Magee views Russell as being impractical. His “genius was for solving theoretical problems” (ibid., p. 268). “He treated practical problems as if they were theoretical problems; in fact I do not think he could tell the difference” (ibid.). This made Russell a “blunderer” in private and public life. “He had so little practical intelligence” (ibid.). The mathematical genius was thus at a disadvantage with the real life problems of philosophy, which is not merely an academic or theoretical pursuit. Russell knew the limitations of language analysis; he apparently grasped in the end that his empiricist profile was a limitation. His flawed psyche (meaning his instinctual excesses) has been lamented by some commentators. Cf. The Autobiography of Bertrand Russell (3 vols, London 1967-69). See also A. D. Irvine, ed., Bertrand Russell: Critical Assessments (4 vols, London, 1999). Copyright © 2009 Kevin R. D. Shepherd. All Rights Reserved.